Some days I think I have too much code “lying around”. As you would expect from many years as a developer, I have utility libraries for all sorts of tasks. Generally when I think something is likely to be useful for others I like to make it publicly available for anyone to use – just take a look at the list of Codeplex projects I admin. This morning I saw a question on StackOverflow about intelligently detecting a platform and loading the proper binaries for it. In this case it was specific to doing so with Windows Mobile barcode scanners. I immediately thought, “hey, I have a library for that” and went to answer and give a link. Except the link didn’t exist. I never created the open source project for it, so the code has just been sitting here doing nothing. Yes, this code is probably 5 years or more past it’s prime useful period due to the decline in use of Windows Mobile, but hey, I just used it on a project last week, so it’s got some life left in it. So, here’s yet another open source library from my archive – the OpenNETCF Barcode Scanner Compatibility Library. Back in 2009 I was doing a fair bit of work for some customers in the security field. I ended up doing some proof-of-concept stuff and ended up with some code that, while not groundbreaking, is at least might be useful to others. It’s really too small to bother starting a Codeplex project for it, unless I get some pull requests, in which case I’ll turnn it into a full project. In the meantime feel free to Download the source. A friend, colleague and fellow MVP, Pete Vickers, brought an interesting product to my attention this weekend. iFactr has a Compact Framework plug-in for Studio 2013. I’ve not tried the plug-in, so this isn’t an endorsement just a bit of information. I also don’t know how they’re pulling it off. It looks like they have WinMo 6.5 and emulator support, and it requires an MSDN subscription. I suspect that it requires you to install Studio 2008 so you get the compilers, emulators and all of that goodness on your development system, and it then hooks into those pieces from Studio 2013. It most certainly is not adding any new language features – you’re still going to be targeting CF 3.5 in all its glory – but the ability to use a newer toolset is a welcome addition. If they somehow are pulling it off without requiring Visual Studio 2008 that will be really nice. If you’ve tried the plug-in, let me know how it went in the comments. If you do much “maker” stuff, you’re probably aware of the Netduino, an Arduino-compatible board that runs the .NET Micro Framework. Cool stuff and it allows you to run C# code on a low-cost device that could replace a lot of microcontroller solutions out there. 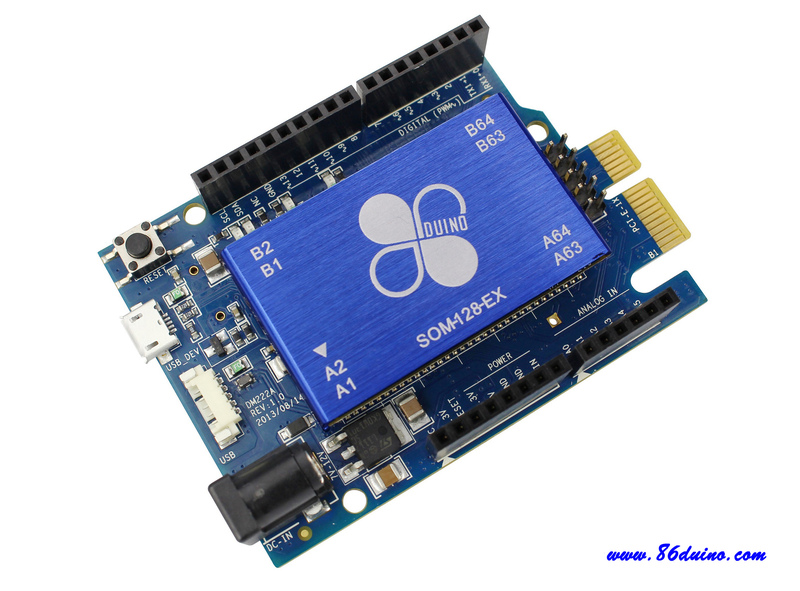 It just came to my attention today that there’s a new game in town – 86duino, an Arduino-compatible x86 board. Say what?! Basically we have an Arduino-size, and Arduino-cost ($39 quantity-1 retail price, hell0!) device that can run any OS that runs on x86. Let’s see, an OS that runs on x86, does well in a headless environment, runs managed code, can be real-time, has a small footprint and low resource utilization? How about Windows CE? There’s no BSP for it yet that I see, but it’s x86, so the CEPC BSP is probably most of what you need for bring-up. I’ll be looking to build up a managed code library to access all of the I/O on this and some popular shields. Any requests/thoughts on “must-have” shield support? Author ctackePosted on December 10, 2013 Categories .NET Compact FrameworkTags Compact Framework2 Comments on Windows CE on Arduino? Yesterday I got a support request for the Smart Device Framework. The user was after a seemingly simple behavior – they wanted to get a Click or MouseDown event for a TextBox is their Compact Framework application so they could select the full contents of the TextBox when a user tapped on it. Of course on the desktop this is pretty simple, you’d just add a handler to the Click event and party on. Well, of course the Compact Framework can’t be that simple. The TextBox has no Click, MouseUp or MouseDown events. Thanks CF team. There are some published workarounds – one on CodeProject and one on MSDN – but they involve subclassing the underlying native control to get the WM_LBUTTONDOWN and WM_LBUTTONUP messages, and honestly that’s just not all that fun. Nothing like making your code look like C++ to kill readability.